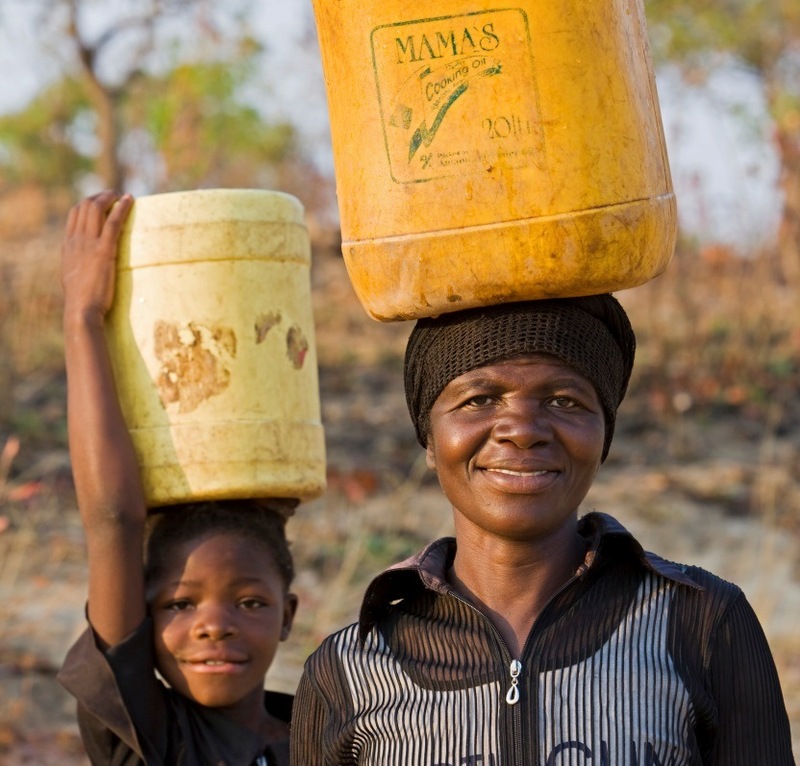 The Life Giving Water Fund – Oh what a difference a well makes! The Life-Giving Water Fund, a donor-advised fund at KBFUS, has drilled 130 water wells in rural Zambia so far, to provide local communities with reliable sources of fresh, clean drinking water. One of the first things most people in North America do each day is turn on the kitchen tap and fill up the kettle for coffee or tea. A bit later, we take a shower. We turn on the dishwasher and the washing machine and the hose to keep our gardens green. Most times, we don’t think about the cost of water or even where it comes from. But in poorer countries, access to clean water is not a given. Millions of people around the world, most of them children, die each year from diseases associated with inadequate water supply, sanitation and hygiene. In Zambia, a landlocked country in Southern Africa, over one third of the population does not have access to clean water. More than half lacks access to proper sanitation facilities. The Life-Giving Water Fund (LGWF) was established to change that narrative. It drilled its first well in 2003 in Pemba, a small town of about 4,000 inhabitants. Today, thanks to the support of generous individuals, LGWF has funded 130 deep, lined water wells in rural villages across Zambia. Hachoose remembers that there was no well in his village. The only water sources were often stagnant and were three or four miles away. At the peak of the dry season, all the local sources of water dried up and the children would have to miss school to walk barefoot even farther to fill just one bucket. He recalls his animals having to fight with people for the same water spaces. “But we were happy as children because we didn’t know any other way. It was only later, as an adult, that I realized that there had to be a better solution.” At age 13, Hachoose left his village to attend a boarding school in Livingstone. He also acquired his first pair of shoes at that time. After five years, Hachoose got a scholarship to study in the United Kingdom. From there, he went to the University of Manchester for a degree in chemical engineering. After working for a mining company in Zambia for a few years, he moved to the United States about 30 years ago. Since he moved to the U.S., Hachoose has been visiting his family in Zambia at least every two to three years. But one pivotal situation inspired him to give back to his country in a much more coordinated way than he ever had before. “The biggest life-changing event for me was in 2001,” he says. “There was a severe drought in the whole of Southern Africa. It was absolutely devastating.” That year he visited in April, which is the peak of Zambia’s harvest time. As a result of that painful experience, Hachoose embarked on a program to try to change things. When he returned to the U.S., he was at first embarrassed to talk about his family’s situation. “I thought it was simply a family matter,” he says. “But I am very fortunate to be surrounded by people in the U.S. who offer a lot of good friendship. So in 2002 over dinner one night, we started talking about things that are important and I mentioned that the situation in Zambia was dire. My friends said that I should share that with the church congregation. And I reluctantly did.” That is when the Life-Giving Water Fund was born. Today, Van Aken manages the partnership with KBFUS, while Hachoose works closely with People’s Action Forum, the local nonprofit partner which oversees the water drilling companies and helps identify locations that are most in need of wells. One of the challenges the team first encountered was how to transfer money to a foreign nonprofit in a way that is compliant with U.S. laws and allows U.S. donors to claim a tax deduction for their contributions. The King Baudouin Foundation United States (KBFUS) is the leading resource for philanthropic giving to Europe and Africa – a trusted advisor for U.S. donors seeking to support their favorite causes and non-profits overseas. To learn more about our donor-advised funds, legacy funds and KBFUS ART, please visit www.kbfus.org.